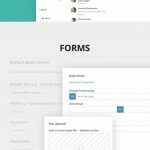 Codex is admin template with full responsive layout. It is the fastest way to build modern admin site or dashboard for any browser or device. It is based on the popular icons such as Material Icons, Font Awesome, Simple Line Icons. All components are built to fit perfectly with each other, while aligning to the material concepts.